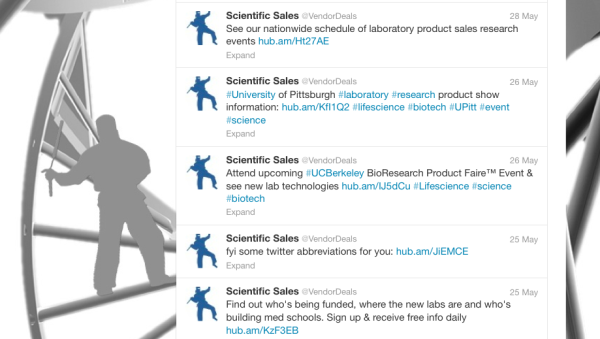 Scientific suppliers can take advantage of product sales and marketing discounts through Biotechnology Calendar's twitter feed. Are you a lab product supplier or service provider? Now you have the opportunity to save hundreds or even thousands every year, reach exactly the target market you want to reach, have access to top funded research markets nationwide, and get the high level of quality and trust that you have come to expect from Biotechnology Calendar. Gold Rush Special: Buy 3 Northern California Shows #UCSF #UCDavis #UCBerkeley get #UNR Nevada Free. exp 5/23 Call 530-272-6675 for details. Monday madness for new customers! Free full event program page ad with any exhibit package purchased. Today only. Call 530-272-6675. Lab marketers can see relevant information about marketing events , request funding stats for top research institutions and find daily deals on this twitter account.